David Clarke skippers Peterborough Town in the Northants Premier Division in 2016. Peterborough Town will attempt to blow Northants Premier Division opponents away with sheer pace rather than tease them out with quality spin bowling this season. Town’s professional off­-spinner Paul McMahon has been ruled out for the summer with a knee injury, but teenage pace ace David Sayer is fully fit again after missing most of last season with a back injury. Bashrat Hussain is Oundle Town's Northants Premier Division skipper this summer. Sayer and Joe Dawborn, last season’s leading wicket-­taker in the top flight, plus under­-rated speedster Jamie Smith, will join forces in a fearsome seam bowling attack. It’s a prospect that excites new Town skipper David Clarke. “Losing Paul McMahon is a massive blow,” Clarke admitted. “But having David Sayer back is a massive boost. David’s been training hard with the Leicestershire Academy all winter and it looks like he’s put on a yard of pace. He’s a top prospect and I expect we will see a few opposition batsmen hopping around this season. “We’re really pleased to have kept last season’s squad together and with David back we will certainly be very competitive again. David Sayer is back in action for Peterborough Town in 2016. “It’s difficult to know how well we will go because the strength of the other teams is hard to predict. “Few would have tipped Rushden to win the league last season. Rushden have reportedly lost key members of their title-­winning squad so Finedon and Old Northamptonians might be Town’s biggest challengers as they seek a fourth Premier Division title in five seasons. Clarke has big boots to fill as he replaces Lewis Bruce at the Bretton Gate helm. Bruce won two Premier Division titles and steered his side to the National Finals of the Twenty/20 Cup for the first time in the club’s history to lay a claim to be the most successful Town skipper of all time. Clarke has captained the odd game as a senior, but has not led a side regularly since his days as a top junior player. He’s confident he can rise to the challenge. Oundle Town are also under new leadership as Bashrat Hussain was elected captain ahead of 2015 skipper Phil Adams. Hussain won’t have South African fast bowler Petrus Jeftha to call on. He’s been replaced, however, with another class South African act in quickie Tshepo Moreki, a man who has played a high standard in his homeland. 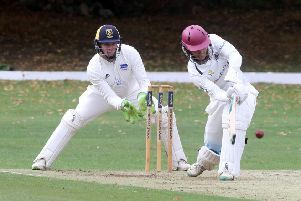 Big-hitting Zeeshan Manzoor has also left the club to play for village club Ketton in Cambs Division One. The Northants League season starts on Saturday, April 23. Town open their Rutland Division One season at Nassington on Sunday, April 24.